Write on and wipe off with your own crayons and cloth! 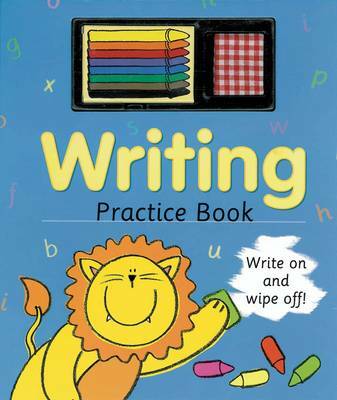 This is a writing practice book, complete with crayons and wiper-cloth, with follow-the-dot exercises for different letters and shapes on each page. Colourful characters help your child to create tricky letters, wiggly 's' like a snake, round 'o' like a wheel and 'l' like the handle of an umbrella. A blank board at the end of the book is a perfect space to practise all the letters learnt. It's easy to practise writing letter shapes with this special book. Draw on the pages with your eight colourful crayons, then simply wipe them clean to try again. Have fun! The join-the-dots drawing and writing exercises and colourful characters on each page encourage small fingers to try to learn their letters and eventually to practise writing words.